OTTAWA (July 31, 2016) – The 105th Grey Cup presented by Shaw is coming to Ottawa in 2017. “We’re bringing Canada’s cup to Canada’s capital in the year we all celebrate Canada’s 150th birthday,” said Jeffrey L. Orridge, Commissioner of the Canadian Football League. The annual championship game of the CFL, the Grey Cup presented by Shaw will be played at TD Place Stadium at Lansdowne Park on Sunday, November 26, 2017. 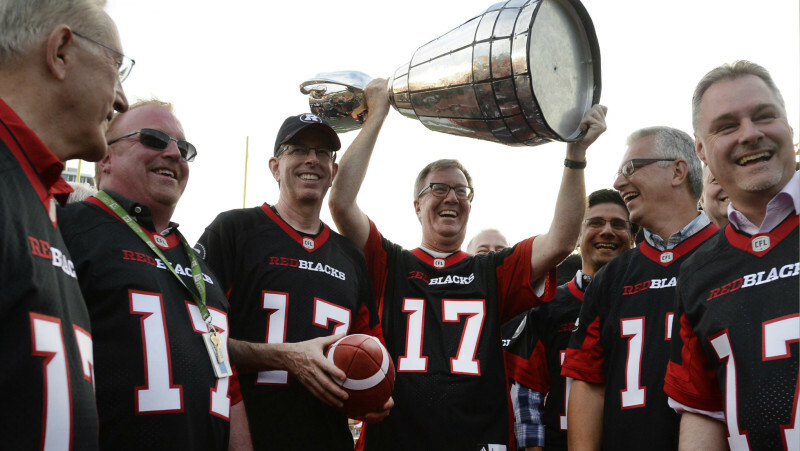 “We are thrilled to host the 2017 Grey Cup and cap off a year of Canada 150 celebrations in the nation’s capital,” said Jeff Hunt, President of OSEG, the Ottawa REDBLACKS’ parent company. Canada’s largest single-day sporting event, the Grey Cup presented by Shaw is also one of the country’s biggest celebrations and most cherished traditions. The game attracts a massive television audience: usually 1 out of every 3 Canadians watches at least part of the game. And it is preceded by a multiday festival hosted by the local team. Canadians from every corner of the country travel to the host city for a massive celebration. Together, the game and festival represent a significant opportunity. The total economic activity generated by the 100th Grey Cup in Toronto in 2012 was more than $133 million throughout the province of Ontario, with $94.7 million occurring in the city of Toronto according to the Canadian Sport Tourism Alliance. Other Grey Cups have reported economic activity in the range of $100 million. “The Grey Cup game and festival are iconic national events that provide a tremendous boost to the local economy, but more than that, they bring our nation together,” said Ottawa Mayor Jim Watson. I was at the last Grey Cup in Ottawa. I had a great time. It is a very friendly city, easy to get around. They will do a great job on the 150th anniversary of Confederation. Riders take GC in Ottawa. I'm down with that! Why is league attendance so low after week 6? Anyone read anything about it?